You're trying to restore a database on the database server but the server is running out of space. You place the backup file on a share/file server but you run into the following error during database restore. These are the errors on SQL Server 2008 when restoring the database using script or through MS SQL Management Studio. Cannot open backup device '\\myShareServer\test\test.bak'. Operating system error 2(The system cannot find the file specified.). account has permissions on it. These are the errors on SQL Server 2012 when restoring the database using script or through MS SQL Management Studio. Cannot open backup device '\\myShareServer \test\test.bak'. Operating system error 5(Access is denied.). I also want to clarify that I'm the system administrator on both servers. That eliminates the philosophy the logon user access control issue. 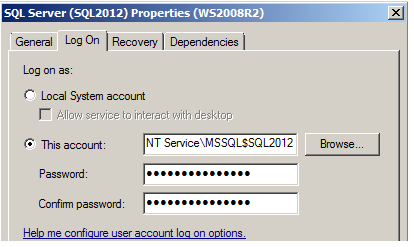 Let go to the services, double click on the SQL Server to bring up the properties and click on the Log On tab. As indicate on Figure 1, on my development environment, the SQL server is running under the context of virtual service account of the database server. The error message did make sense now because the virtual account is foreign to the file server and there no way to add those account to the ACL. There are several options we can employ to tame the error. Set the SQL Server to run under a domain account. Depending on the Group the account under, you might need to add the account to the file server ACL. I hope someone will find this information useful and equip you for future opportunity. If you find any bugs or disagree with the contents or want to help improve this article, please drop me a line and I'll work with you to correct it.